I remember reading about this some years back, and found it fascinating then. In my memory it was the American poet and critic John Crowe Ransom who was the teacher, but in searching this week for more detail, the perpetrator named was English poet and critic I. A. Richards. My memory still says Ransom did something similar, but let’s stay with Richards since I can verify it. The time frame is the 1920s. The Modernists (due to painful copyright laws, the newest poets whose work can be freely used here by the Parlando Project) had begun their ascendency into the mainstream of English language poetry. But the Victorian era, including the later work of the Romantics and the whole of the William Morris/Pre-Raphaelite revival that preceded the Modernist revolution was not that long ago, within the memory of teachers and critics alive then, like the post WWII era or “The Sixties” would be today. The Romantics had been a revolution in how poetry speaks, and those that followed them took different paths from that revolution, and now the Modernists proposed a counter-revolution, once more changing how poetry speaks. Had poetry, in some Platonic ideal state, it’s essence, changed; or had only the language and form it took to express its inner nature changed? In such at time, the question of aesthetics, of what constitutes poetry and what are (or should be) its goals and effects, would naturally come to the fore. If one is a teacher, one might examine this by teaching, and so Richards devised an experiment. He gave students at Cambridge, a leading English university, a packet of poems which were without the names of their authors or any context about when they were written—they were even without their titles—and asked the students to write about them, to interpret them. I’m not sure if he presupposed what the results would be, but summaries of the experiment report he was surprised at the results. Their interpretations were poor, and often included what he knew to be misinterpretations. The students often resorted to personal experiences or rote sentimentality to explain the poems. As a result, the interpretations of the poems varied considerably as they missed their mark in different directions. You might think, “Well, duh!” In subsequent theories of literature all these effects have been explained and codified in multiple ways, but at the time, in the 1920s, this was a new finding. 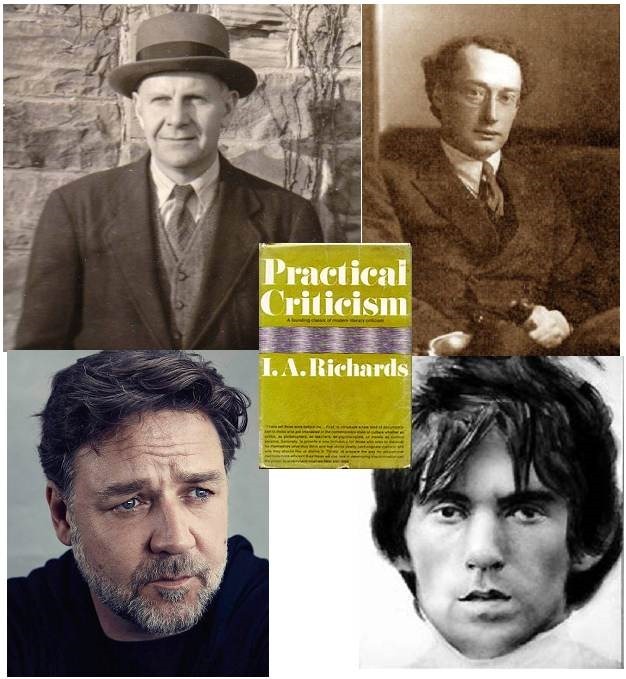 Richards thought this showed a failure of literacy, defined as a kind of higher literacy; not the inability to read basic English, but to read and understand the kind of associative and musical language used by poetry. He spent his life trying to remedy this by teaching. In 1979, while in his eighties, he was still teaching, in China, when he fell ill and died. He wrote a book, titled “Practical Criticism” setting out ways to properly read and derive the effects of a poem. But the way I heard of the experiment (and this may have been a subsequent experiment, inspired by Richards, perhaps by Ransom) the packet of unattributed poems given to students to interpret included a range of “not great poetry,” pop poetry as printed in mass-market publications as well as the work of more esteemed poets. And the result was the students couldn’t reliably distinguish the great poets from the hacks. When, a generation later, I began to encounter poetry in school, “The New Criticism” was by far the predominant idea of how poetry should be taught. At the end of my scattered schooling, new theories were arising, Deconstructionism and the like, and I can still recall professors muttering about its willful misunderstandings and mistaken goals as I struggled for money to pay for one more class that would fit into my work schedule. Now in this century, I know less what happens in schools, but I sense culturally we’re concerned increasingly with the poet as the container that holds the poem and its experience. Some worry about “Identity Politics” and its correlate would be “Identity Poetry,” where the background, ethnic and otherwise, of the poet is integral to the poem. I’m too busy making art to have a coherent philosophy on this. I can easily envision problems arising from a division of poetry into ever smaller spheres where only the right combinations of ingredients can make or appreciate some work. On the other hand, I’m also suspicious of the motives of anyone who claims to hate Identity Politics or Identity Poetry, while showing no interest otherwise in smashing the walls and peeling off the labels from artists for whom those “stick to that” labels and barriers may not be self-chosen. Oh my, what a long introduction to today’s audio piece! In honor of Richards and Ransom and their experiments, here’s a piece I call “Poetry in Translation” for the purposes of the experiment. I’m not going to give you any more context for the poem used, the author’s name or their ethnic identity. I assure you I’m not in this for “gotcha” or obscure literary one-upmanship. It’s short, so give it a listen and see what you think. I’ll be back later this week with more.